I run across these vintage glass snack sets at the thrift stores. All. The. Time. The day I picked this one up, I had at least 40 to choose from. It was a regular glass-a-palooza. 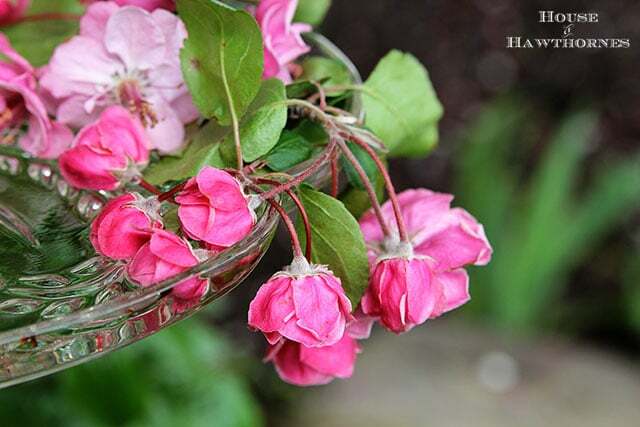 They were made by Hazel Atlas, Federal Glass, Anchor Hocking and probably every other glass type company back in the day. Every self respecting mid-century hostess had her glass snack set and a glass punch bowl in her party planning arsenal. (Whoa Nelly, little Miss Bluebird is either the cutest bluebird or the tackiest. Depending on what side of the kitsch perch you sit on). I decided I wanted to repurpose my snack set into a snack set for the birds. Real birds, not china ones with sparkly eyes. A place where a bird could sit and relax, have a little nosh and chat with a few friends. Doing so, all the while, in the lap of 1950’s luxury. Depending on where you buy the pipe, it may come in the correct length already. If not, have the ever helpful plumbing department specialist (who worked at Taco Bell last week) cut the pipe to length for you. I wanted mine to sit just over my peony bushes, so 3 1/2 foot worked for me. 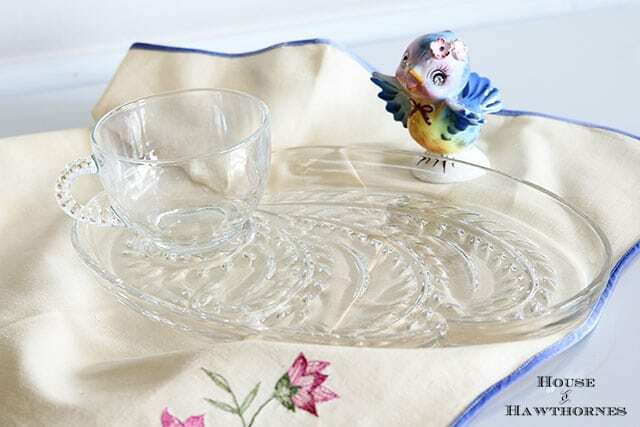 Wash and thoroughly dry glass tray and cup. Apply the J-B Weld to the rim of the larger part of the copper adapter and adhere to the bottom of the tray. Let dry thoroughly. 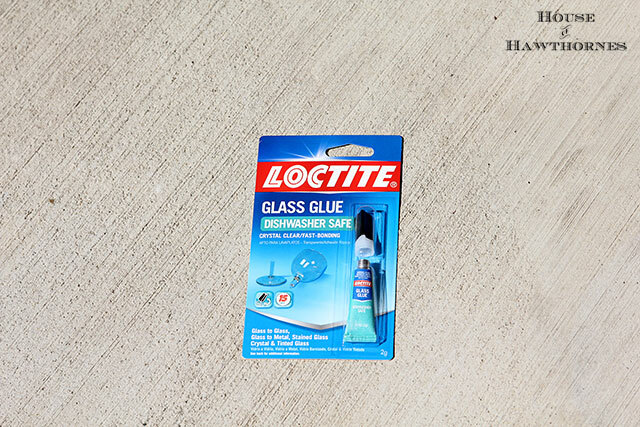 Apply the Loctite Glass Glue to the bottom ring of the cup and adhere it to the designated cup area of the tray (the trays have indented areas to keep your beverages away from your cucumber sandwiches). 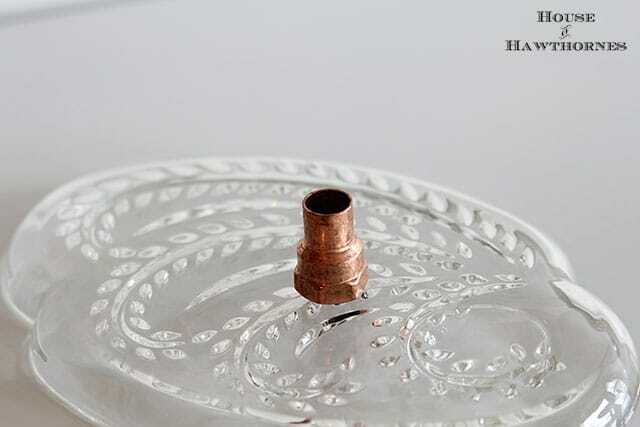 Note: I used two different glues because the LocTite Glass Glue is great for adhering glass to glass (cup to saucer), but not so much for adhering metal to glass (pipe to saucer), so I used the J-B Weld to adhere the copper adapter to the bottom of the plate. I didn’t want the whole thing to come crashing down onto the ground when one of those fat robins sat on it. If you like, you can drill a small hole in the bottom of the cup so excess water can drain from the seed cup. You will need a Glass And Tile Bit Set for this. Totally optional as you can just as easily change out the birdseed if it gets too wet. 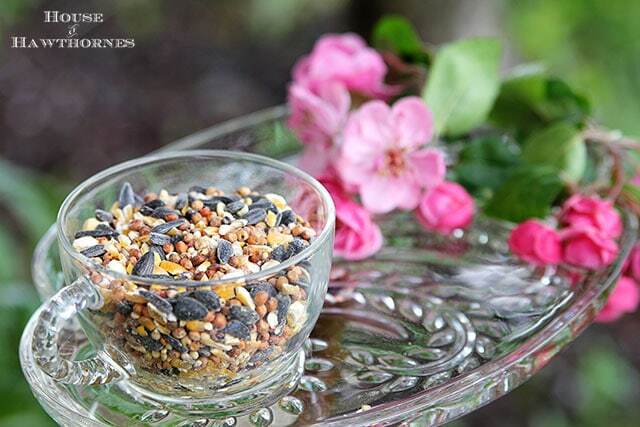 Fill the cup with seeds. Pound stake firmly into the ground and slide copper pipe over the stake. 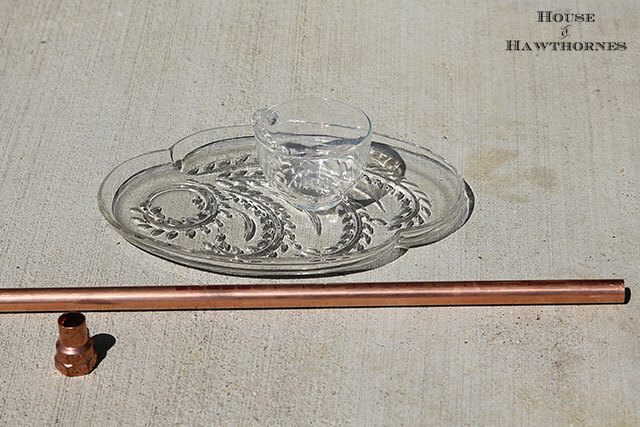 Slide your snack plate with copper adapter over the top of the pipe. I also added water to the tray area, so they could have a little sip or swim while they were there. Then sit back and watch your birds have a fancier lunch that you are having. And for all you bird lovers out there, I just used the flowers to pretty up the photos. Totally not necessary. Your birds won’t hate you if you leave out the flowers. OK, get off the computer and feed those birds! How precious for your yard birds! You are so much handier that I am. That was clever, indeed. Like it. Oh, I love the idea and what a nice bird feeder. Your birds are at a first class restaurant. Thanks so much for sharing this – I have tons of snack sets and they will look so pretty in my garden. 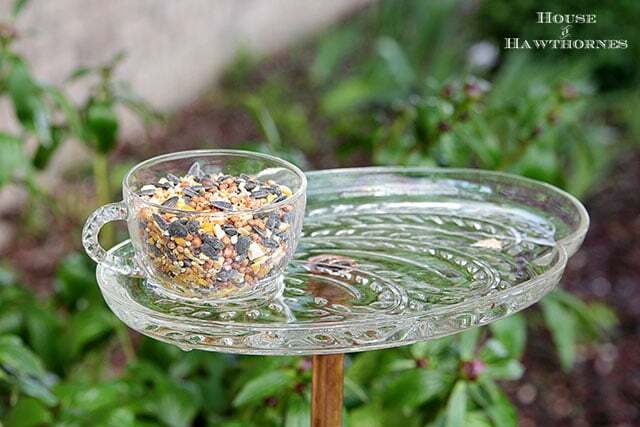 Your sparkly little bird feeder looks so cute! I, too, usually have about 14 different glues in various craft bin drawers. When I go to use any of them, the one that I need for whatever I am gluing is dried up. I thought the little birdie was cute kitsch. They are always in the glassware section at the local thrift stores around here. And they’re cheap. I think I paid around $1.50 for the set. Love it! I have a small collection of snack sets, so I’ll have to give this a try!! Thanks! That is just adorable–I love it! Very clever! I have inherited 2 snack sets from my late grandmother. One of them, the plates are in the shape of a Asian fan (totally reminds me of Josie). 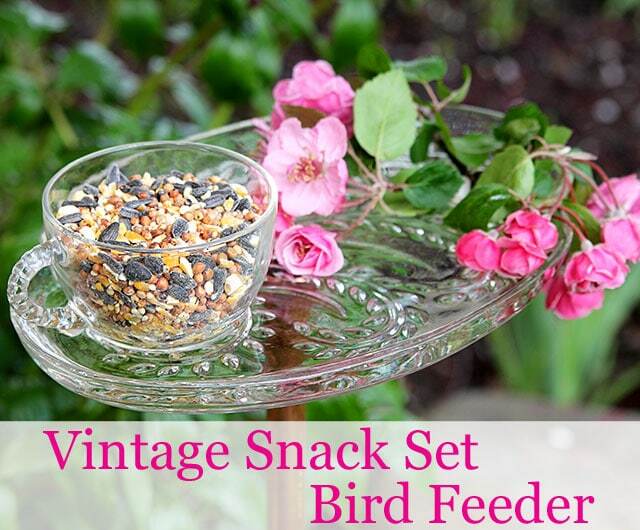 The other set definitely has bird feeder options written all over it. I’ll be showing this post to Chris later. Oh how cute Pam. I made one of these a few years back. I have never seen that glass glue. I believe I used gorilla glue and it was awful to work with. You feeder is adorable! I see those snack sets often too, guess Canadians were big on them too. 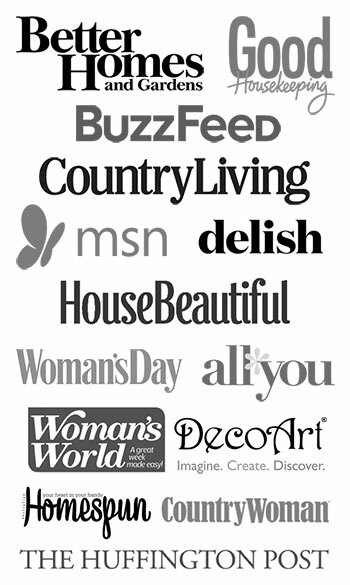 I have two that belong with my china – never been used!!! A few years ago (before we knew better) Hanna and I bought a few of those snack sets in the original boxes from the thrift store. We thought we had hit a goldmine! Vintage glassware in the original box? SCORE! We couldn’t even sell them at our garage sale later that Summer. For $2 a box. Back to the thrift they went. Then we laughed like maniacs when Country Living magazine called them “Highly Collectible” in one of their issues that came out shortly after. I have a hanging bird feeder made out of a jar, one of the snack server trays, and a chicken feeder. I’m gonna have to try this though. Believe me, there is an abundance of these trays at the store. In the original box. I love it … and NEVER have seen it before…a great use for those snack sets that are everywhere and no one wants them !! Thank you! 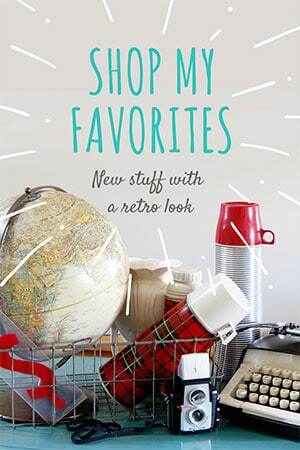 You do just about trip over them at the thrift stores, don’t you! I have never seen a bird feeder as sweet as this one! I’m not much of a DIY person, however, you explained the process of making this so well I’m going to give it a shot. I’ll be the envy of the neighborhood thanks to you! That is the most beautiful feeder I have ever seen! What a great idea! Love this! Very cute! I’ve been wanting to do something similar and yours came out so day nice. What a sweet little project! Love it! Looking forward to a live action shot when your first diner arrives — I too see these hostess sets all the time and now they have a new purpose in life thanks to you. I was also unaware that burrito folding skills transferred to plumbing! 🙂 And yes, my home glue collection is rivaled only by my random-gallons-of-paint collection. Pam this is your cutest project yet. I love it. 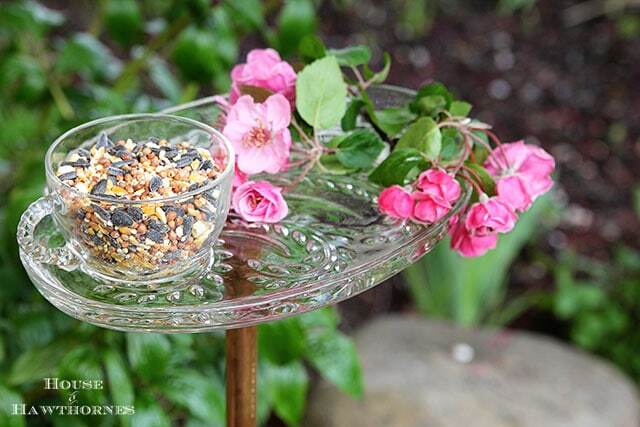 OMGosh I am working on a glass bird feeder however out of just the plates and flower vases. I was wondering how you got it to stick in the dirt with breaking it? LOVE it !!!!!!!!!! It’s the tomato stake. If you pound it in first you just slide the copper pipe over it like a sleeve. It was one of those plastic/resin type tomato stakes. Really cute idea Pam! I may have to make a couple now! We must be on the same wavelength! I have been thinking about doing a post about the many different ways to use snack sets. 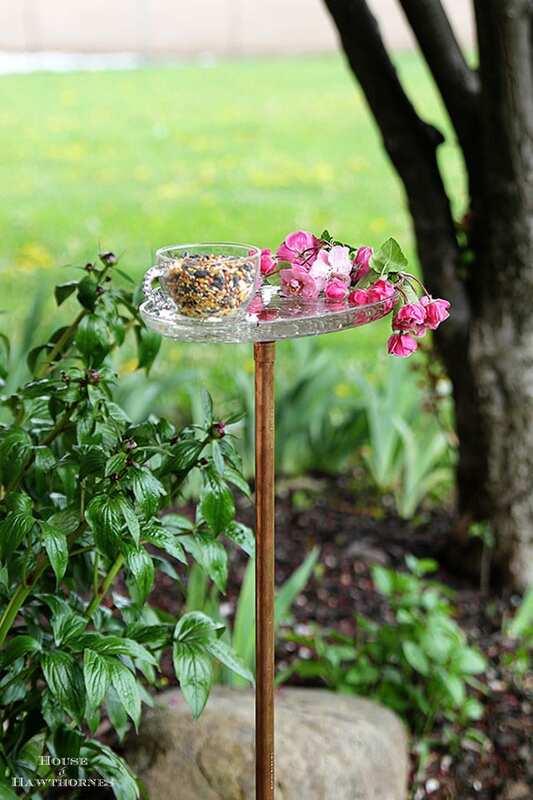 Making a set into a bird feeder/waterer is a super duper idea and not one I had considered. Thanks for the shout out and I guess I had better get busy on that post!!! Oh, love your photos!!! The birds will love the flowers, too!!! I use the plates of vintage snack sets to hold small potted plants on windowsills. They are just the right width for my windowsills. And they wash up beautifully when soil or muddy water spills on them.